Polenta is a lot like great tasting silly putty or play dough. If you leave it to sit and cool, it will harden and hold a shape. That’s why so many plant-based cooks like to use it as a gluten-free substitute for pizza crust, lasagna noodles, or bread. I first learned to cook it from scratch in the context of making the pizza in Prevent and Reverse Heart Disease. Then I went on to make Susan’s delicious Polenta Lasagna with Portobellas and Kale. As much as I enjoyed the pizza crust, and the lasagna, along the way I made a surprising discovery: I liked the plain, soft polenta right out of the pan best of all. It has its own kind of simple, elegant poetry. I actually think recipes and poetry have a lot in common. They both use language to instruct us in the mysteries of transformation. I’ve long wished to incorporate the language of recipes into my poetry. I first became enchanted with this a long time ago when as an undergraduate I heard poet Robert Hass read at Cal State University, Sacramento. He admitted that he loved to sneak recipes into his poems whenever he could. He was introducing what was then a new poem of his called “Songs to Survive the Summer” and he told us about how he was pleased to have incorporated a recipe for onion soup within the poem. I was delighted when I heard it. And a bit envious too. And a Tbsp. of Sasparilla. Mix thoroughly, heat in microwave until boiling. Pour on paper, let sit for eternity. Makes infinite servings. To my mind, these are hard acts to follow. Nevertheless I thought I’d try to write a poem that would also be a recipe for how I cook my soft polenta. Unfortunately, although it works as a poem, a Shakespearean style sonnet even, it’s not really specific enough to stand alone as a recipe. So you’ll have to read a poem for some of the recipe directions, and then read a recipe that’s sort of like a poem for the rest. 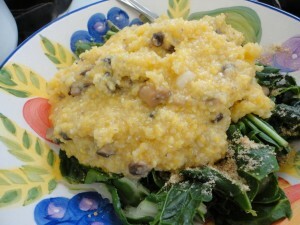 Perhaps together they will entice you to try making your own easy, mouth-watering fat free soft polenta magic. I hope so. Moisten it with a little water first. In a small, clear bowl, make it clump like sand. colored like sunflower dust on your hand. Cut up three mushrooms; dry sauté in a saucepan. They will curl, darken, sweat out sweet earth-smell. yellow lava blistering its own lung. Grate in garlic. Lick warm magic from spoon with tongue. Follow the directions in the first four lines of the poem. Chop mushrooms. Heat a saucepan; dry sauté the mushrooms over medium heat until they exude their juices and turn slightly brown. 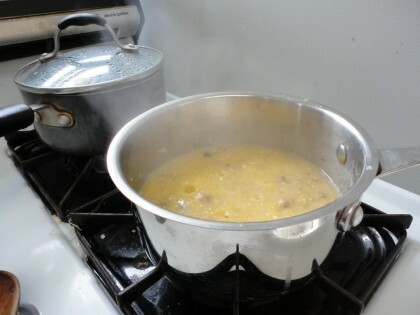 Add the 1½ cups water to the mushrooms; bring it to the boil. Stir in the moistened polenta with a fork. Think of golden otters and waterfalls while you stir it with a spatula continuously on low heat, for 5-10 minutes, as long as it takes for the polenta to thicken and blister into yellow lava. Follow the directions in the last line of the poem. Spoon onto steamed broccoli or greens. Top with sauce and/or cannellini beans if desired. To paraphrase Robert Hass not quite accurately, huddle with your warm bowl. Spoon. Eat. Daydream of making more to share with friends. April has been National Poetry Month, and this is officially the last day. But you can keep the celebration going by heading on over to this link at Finishing Line Press to preorder my chapbook of sonnets if a sparrow. Or ask your local library to preorder it. And while you’re there, treat yourself to The Apple Tress at Olema, New and Selected Poems by Robert Hass.Thanks to everyone who has supported me thus far toward meeting my goal of 55 preorders by July 12 so my chapbook will be printed in September. And thanks, too, to those of you who will add to that goal in the coming days and weeks. “like sunflower colored dust in your hand” MELTS my heart! very lovely, dear. Thanks, Beth, and welcome! I include mushrooms in stuff every chance I get. They really are superfood! You’re welcome, Kathleen! So glad you liked it, and that the imagery was good company while you stirred. That’s lovely to hear. Previous post: The Miracles Keep Coming. . .